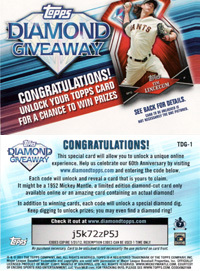 Earlier this morning, Topps officially launched their highly anticipated Diamond Giveaway promotion website, which more importantly means collectors can now enter their Diamond Giveaway code cards to unlock past Topps cards and other unique prizes. After entering 10 codes myself, the Diamond Giveaway promotion is nearly identical to last year's Million Card Giveaway promotion, only this year, you gain 1 "dig point" for each card you unlock. Each dig point gives you a chance to win an additional prize buried beneath a virtual baseball field you unlock on the Diamond Giveaway website. What is the Diamond Giveaway? Topps Series 1 and Topps Series 2 and Topps Update Series baseball cards contain a special "Diamond Giveaway" code card. 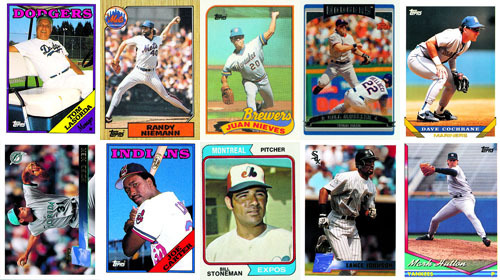 When you enter the code on our site, it unlocks one card for your collection, which you can trade and look at online. The card can be a Topps card from 1952-2009, a diamond embedded 1/1 card or a special Diamond Die Cut card. In addition once you unlock your card you have a chance to dig in the diamond dig. You can dig up and win instant prizes including a diamond ring, Topps 60th Anniversary Ring, Old packs of Topps cards or digital rings, the more digital rings you collect the more prizes you can win! The cards are securely stored by Topps, in a temperature and humidity-controlled environment, at no additional charge to you. While cards are held in your portfolio, you may continue to hold them in your account, trade them with your friends. At your convenience, you may request delivery of the item to the shipping address associated with your Diamond Giveaway account. What is the Diamond Dig Giveaway Game? Once you have unlocked your Topps card, you will have a chance to dig in the Diamond Dig. You will be given your own field with 250 plots in which to dig. Each code lets you pick a new place to dig. Each plot has a prize buried in it, prizes include Topps 60th Anniversary Card sets, a diamond engagement ring, a Topps 60th anniversary ring and virtual rings. For even more fun, you can collect the virtual rings for even more prizes. When you hit different ring levels, you will automatically be eligible for prizes. There are 3 different types of Virtual rings to collect. There are 30 rings representing each of the current MLB teams,15 rings representing legacy teams and 15 player rings. You can collect the rings for more prizes and trade them with others. *If you have any additional questions that were not addressed above, don't be afraid to ask using the comment feature at the bottom of the page. @joe powers: go to http://www.DiamondTopps.com and if you don’t have an account, sign up for one quick and then you can start entering. Is the dig game not working for anyone else? It loads the game screen and lets me dig a single hole that contains nothing. It still says I have the same amount of digs left after I do it. @Derek: Yep, I would try again tommorrow, that’s what I plan on doing. When I dig I get a shovel but nothing else happens. @Jeff: Same thing happened with me, I’m guessing it’s either a temporary glitch or due to traffic volume. I plan on trying again tommorrow. I tried to”dig” and nothing happened(one hole dug and it froze).Did you dig? @Jeff: Yep, exact same thing happened to me, I’m guessing it’s either a temporary glitch or due to traffic volume. I love how they launch a Web site that isn’t even ready. What a joke–we can’t trade our rings, and nowhere is there any sort of update on when this will happen. Why does Topps launch an incomplete contest? What is the matter with these people? When I go to a Web site that says “trade rings,” I want it to work. If it isn’t ready, don’t put the option there and tell us why. @stellarbowler: I completely agree, it frustrates me as both a collector and as someone whose job it is to cover the latest industry news from the sports card world. When can you trade cards and rings? When is topps going to open the trading option.This is getting extremely irritating.An update would be nice. where do I enter code ??????? I have a Diamond Card. Where is the code to enter? @john kinnanea: unfortunately, I think what you have is a diamond parallel card. The Diamond Giveaway cards feature a code on back that is visible and the card features a horizontal layout. a total of 30 different wins it. this is nothing but a scam from topps. Been doing well on Topps diamond giveaway. Trading goes live 4/1/11. Digs are working now. I had trouble earlier today. It’s not too fun trading on the site anyway, you have to refuse 1000 ridiculous requests before you get one that makes sense. I trade for all the Tiger cards I can. Think I added 8 cards to my collection last year. Just save all the deliveries for the end so you save on shipping. I also have 45 plus rings… how many more do i need………….. I believe there are a total of 60 rings, as a friend of mine is up to 59 and can’t figure out what the final ring is. Where do I enter my Diamond Giveaway code? I had Mickey Mantle ring 2 months ago after I put 27 codes in it and I got Mickey Mantle ring…and then somehow I dont even realize it until I entered 41 codes last week and I thought I made it to 60 rings turn out there was missing is Mickey Mantle ring…I am feeling like Topps took mickey mantle off my rings list…I wish I would had screen shot and save it. Somehow I thought I won few prize and it pop up said Server 500 internet problem, asking for screen shot and email it to Topps Customer Service. I email them few time and they kept said you need 60 rings to win prize. I still dont get it how this game suppose to be. Even though I know Mickey Mantle ring was on my list 2 months ago and I dont even log in for a while long until last week when I had 41 codes to entered thats how I found out missing mickey mantle ring off my collection list. Total 68 rings so far and no mickey mantle ring! Grrrr. The dig portion is still not working for me. I get a field that is half dug up and can’t do a thing. Is there a checklist for the rings? Why don’t I even get a shovel? Put your cursor on the X that is in the box which pops up in the middle of your screen, then click it. After clicking on the X a shovel will pop up. Then just move the shovel to which ever plot you want to dig up, then click again. I never see any X pop up.. just a field with dug up holes and I have yet to be able to use my digs. I think they topps needs to hire an entire new IT department. Cannot login again today. Might as well take my cards and run the next time I logon. They are taking the fun out of it by not being able to access the site. Haven’t been able to access trades all weekend. All I can do is see my collection. I will not buy anymore codes because I wouldn’t be able to trade them. If they do this next year I hope they add some servers. Bryan april 7 You never had a Mickey Mantle ring because no one has dug it up yet.Ive been checking since contest started..I think whoever has most rings wins..if they ever get site back up…Wheres the Mickey Mantle ring at? Jimmy (ID 36451) � The Mantle’s are extremely tough to find, but they are hiding on random grids – just not all of them. I believe if you read the complete contest details, the odds are in the fine print. It is definitely NOT whoever has the most wins. When Is Site going to be back up? Did you contact Topps. If you’re on Twitter, @ToppsSupport might be able to help you. I’m not rich by any means so it was totally disappointing that topps couldn’t even get their giveaway program fixed. I couldn’t get a shovel for my digs for months. never did get one. chris burkett � Those codes expired a long time ago. I still have a bunch of these old cards with codes on them. I know the codes are expired, so is it even worth to keep the code cards?